During the past couple weeks, we learned how the Holy Spirit gives us kinetic POWER to go and share the Gospel with other people. Today, I would like to introduce another factor that influences how far and how high the Holy Spirit’s power will take us. Let’s begin with this question: Are you more like a dog or a cat? The master pets a dog, and the dog wags its tail and thinks, “Ahh, He must be a god.” But when the master pets his cat, the cat purrs, shuts its eyes and thinks to itself, “Ahh, I must be a god.” I’m afraid there is still a tendency in us to think like the cat! Motivational experts use this slogan: "Your attitude determines your altitude." We are told that we need to have some arrogance that just brushes aside obstacles on our way to success. From "trash talking" in sports to "in your face" business attitudes, we are told that arrogance is the key to success. Compare that, if you will, to the attitude shown by Jesus Christ. Phil 2:5-8 Your attitude should be the same as that of Christ Jesus: Who, being in very nature God, did not consider equality with God something to be grasped, but made himself nothing, taking the very nature of a servant, being made in human likeness. And being found in appearance as a man, he humbled himself and became obedient to death-- even death on a cross! Paul tells us here that Jesus was "in very nature" (in essence) God. What was his attitude? He took upon himself the nature of a servant, a man of humble circumstances, and submitted to the same authorities that we must submit (The Father, parents, government, etc). Consider then, the changes Jesus voluntarily made: He went from "in very nature God" to man. Not just man, but humble man. Not just humble man, but a poverty-pressed wandering preacher. Not just a wanderer, but persecuted. Not just persecuted, but abandoned. Not just abandoned, but crucified. Now consider his altitude. While hanging on the Cross, the motivational experts would seem to be right. That humble attitude, it would seem, cost him everything – until – Resurrection Day. Let me read further from Phil 2:9-11 Therefore, (because He humbled himself) God exalted him to the highest place and gave him the name that is above every name, that at the name of Jesus every knee should bow, in heaven and on earth and under the earth, and every tongue confess that Jesus Christ is Lord, to the glory of God the Father. We are often instructed to remember Christ's death at the time of Communion. I remind you now what preceded it: the greatest change in circumstance ever known, from heaven to earth itself. The change was voluntarily made by His love for us. His exaltation came after He humbled himself and became obedient unto death. Matt 23:12 For whoever exalts himself will be humbled, and whoever humbles himself will be exalted. Are we humble or proud? Here are few simple questions to test ourselves? Are we too proud to confess our sin and acknowledge our need for Jesus and His Spirit? Are we too important to take on the menial tasks in the church? Are we afraid of the embarrassment we would suffer if we spoke to others about the grace of God through Jesus Christ and our relationship with Him? Our attitude should be that of Jesus Christ. Remember his attitude and see His altitude. He is the Way, the Truth, the and Life. Let’s dedicate ourselves to following Him and becoming like Him. Then where He is, we shall be also. Now I want to mention another attitude we must have to soar like an eagle at high altitudes. 1Thes 5:16-18 Be joyful always; pray continually; give thanks in all circumstances, for this is God's will for you in Christ Jesus. Be joyful always? How? By praying continually and giving thanks in all circumstances. If you ever wondered what God’s will is for you, here it is! (Read it again). The key to having the proper attitude is prayer. Continual prayer requires that I concentrate on God instead of myself. The purpose of prayer is to maintain our high altitude with God amid whatever condition we are placed. Through prayer, we connect with God and He unites us into His way of thinking. By praying continually, we see the presence of God all the time, in every situation. The attitude of being thankful in the Lord does not depend upon external circumstances, but on the love we have for God Himself. Fussing generally ends in sin and brings us down. We imagine that a little anxiety and worry is an indication of how wise and concerned we really are; however, it may be an indication of how wicked we really are and how little we trust God. Matt 6:31-33 So do not worry, saying, 'What shall we eat?' or 'What shall we drink?' or 'What shall we wear?' For the pagans run after all these things, and your heavenly Father knows that you need them. But seek first his kingdom and his righteousness, and all these things will be given to you as well. Yes, an ungrateful attitude and worry place us at a very low altitude. Look up and focus on Jesus. None of us have endured anything as hard as what Jesus went through for us. As God’s children, we have to be careful that we keep looking in the face of Jesus for His kinetic power to endure opposition. Otherwise, we shall find our souls filled with hatred and fear, indicating we are demonically influenced instead of led by the Holy Spirit. Giving thanks is the right attitude in every circumstance to maintain our relationship with God. Consider a simple example that often trips us up. If we grumble in the morning about having to get up, soon we feel irritable. At this point, satan has control of our flesh instead of the Holy Spirit. Our whole day will be spoiled unless we immediately refocus and begin praising God for letting us see another day and thanking Him that we have the ability to get up. Thanksgiving is to be our attitude and it determines our altitude. Whatever problem we face, look up, see Jesus, and give Him thanks for understanding your situation and enabling you to overcome by His grace. As we pray words of thanksgiving, we will begin to feel thankful. We will see things differently. We will be lifted up and our mood will be joyful instead of irritable. God arranges circumstances and brings us into difficult places to enable us to mature and become more like Jesus. We can pray for grace so the life of Jesus can develop in us during those conditions, or be backsliders, who fuss, complain, whine, and deprive God of glory. The things we are going through are either making us sweeter, better, Christians, or they are making us more bitter, fault-finding, and more insistent on our own way. As a result, our attitude determines whether our altitude is in heaven with our Father, or in the dirt with the devil. Again, prayer is the key. Don’t fail to pray and get God’s grace in your time of need. It will change your attitude and determine your altitude. Rom 8:17 Now if we are children, then we are heirs-- heirs of God and co-heirs with Christ, if indeed we share in his sufferings in order that we may also share in his glory. Through Jesus, we will suffer, but we will not be overcome by troubles, trials, or temptations. On the contrary, we will be victorious! 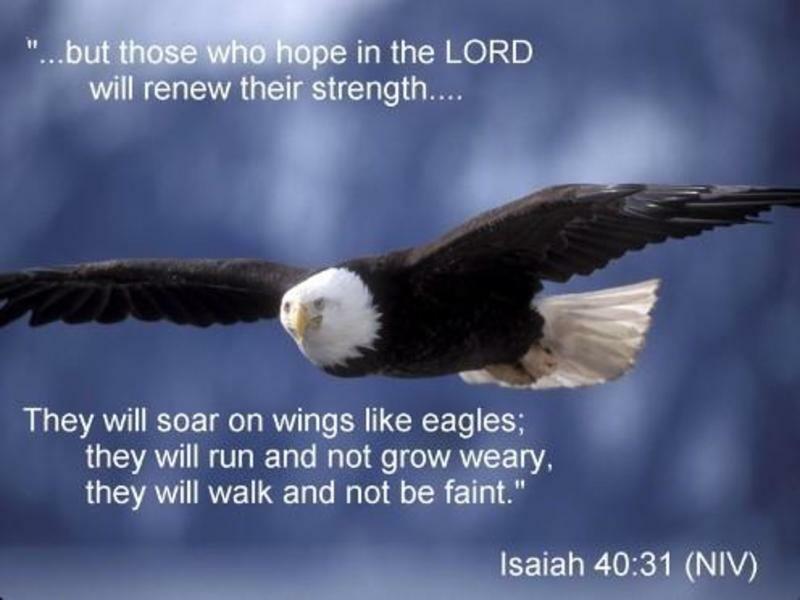 We will soar like an eagle with the kinetic power of the Holy Spirit. Col 4:2 Devote yourselves to prayer, being watchful and thankful. Praying and worshipping God will change our attitude and lift us into the blessings of the heavenly realm, knowing that our Father is working everything according to His wisdom. Ps 107:1 Give thanks to the LORD, for he is good; his love endures forever. Do you know that peace today? Can you thank God for your salvation? If not, you can experience that salvation and peace today. Humble yourself by confessing Jesus as Lord, follow Him in baptism and this will become the most thankful Thanksgiving you have ever had. Maybe you are going through a difficulty that has made it hard to look up and be thankful. We will pray with you to receive grace in your time in need. The times are hard; we all have trials of some kind. Yet, God works all things for good to those who love him. Ungratefulness shows a lack of trust and love for God, and it brings us down. God loves you. Will you look up and give God a sacrifice of praise and thanksgiving from your heart today?